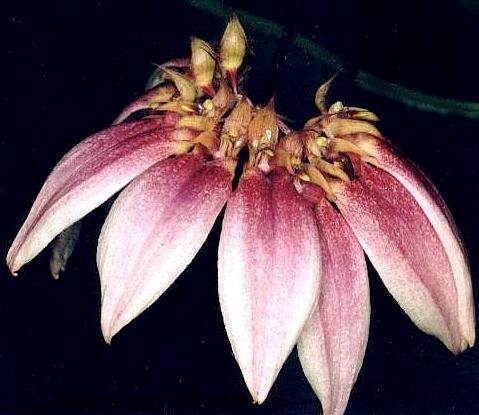 Found in India, Myanmar, Laos, Thailand, penninsular Malaysia, Cambodia, Vietnam and Indonesia in semi-deciduous and evergreen forests on mossy rocks and tree bases at elevations of 300 to 1100 meters as a miniature sized, hot to cool growing epiphyte with a woody rhizome and 2" between each conical, unevenly 5 angled, shiny pale green pseudobulbs carrying a single, apical, erect, oblong, shortly and obtusely bilobed apically, abruptly narrowing below into the shortly petiolate base leaf that blooms on 2 to 3, basal, 6" to 9" [15 to 22 cm cm] long, shiny purple inflorescence with 3 tubular, acute bracts and narrowly lanceolate, acute, concave, reddish brown floral bracts all holding the 11 to 13 flowers above the leaf and held in an umbel. 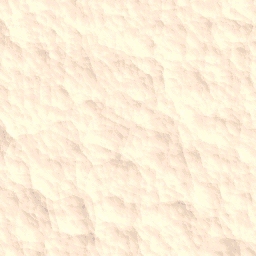 This species requires regular waterings and fertilizer, high humidity and good air circullation. 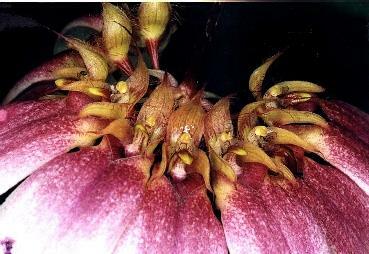 This species has recently been given the name Bulbophyllum flabellum-veneris (J.König) Aver. 2003 with the basionym of Epidendrum falbellum vernis J.König 1791 but J J Verm, O Byrne and Lamb 2015 state that they cannot find within the description by Koenig the most obvious diagnostic character of B lepidum which are the rounded stelida, so they have rejected B flabellum-vernis as a nAme for B lepidum. They do not state if it is a valid other species or not. Bulbophyllum gamosepalum is often cited as a synonym of this species but if Garay is correct [see B gamosepalum] then these are both individual species. B obtusiangulum is often cited as a synonym of this species but for now I have it and it's synonyms listed separately. So see also B obtusiangulum.